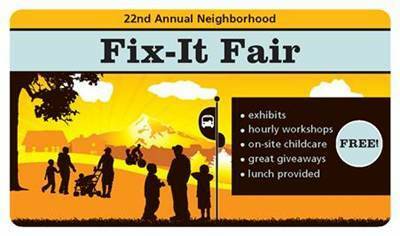 22nd Annual Fix-It Fair is a free event designed to save you money and connect you to resources. Join your neighbors and talk to experts about how to spend less and stay healthy. February 7, George Middle School, 10000 N Burr Ave., Portland Hours: 8:30 a.m. – 2 p.m.
* lead testing & more! Free lunch and childcare provided. Organized by the City of Portland Bureau of Planning and Sustainability in partnership with other City bureaus, Energy Trust of Oregon, Pacific Power, Portland General Electric and the Portland Development Commission. This entry was posted in Events and tagged Fix It Fair by Noah Brimhall. Bookmark the permalink.